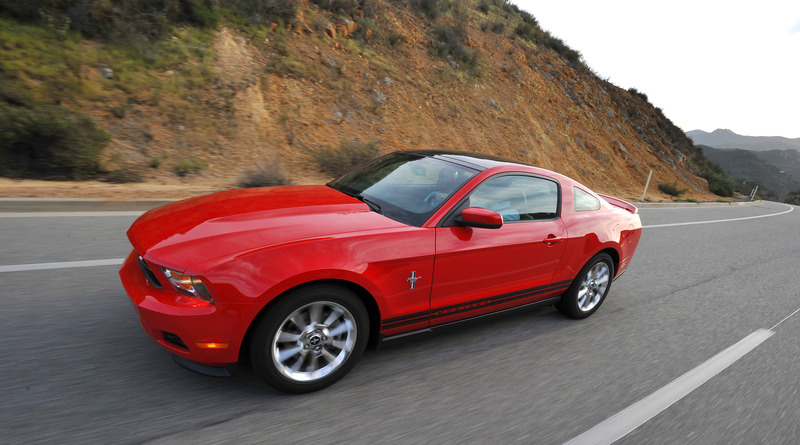 The 2011 Ford Mustang V6 puts 305 high-performance horses in the hands of V6 coupe buyers with a new all-aluminum double-overhead-camshaft (DOHC) engine that delivers 31 mpg on the highway with a six-speed automatic transmission. The all-new six-speed automatic is joined by a six-speed manual transmission for the shift-it-yourself crowd, while handling and cornering is bolstered by the addition of Electric Power Assist Steering (EPAS) and a host of suspension improvements. "This car marks a new era for Mustang," said David Pericak, Mustang chief nameplate engineer. "We're adding technology and fuel economy to Mustang's legendary reputation for handling and roadholding; it's really going to attract a whole new group of Mustang buyers." 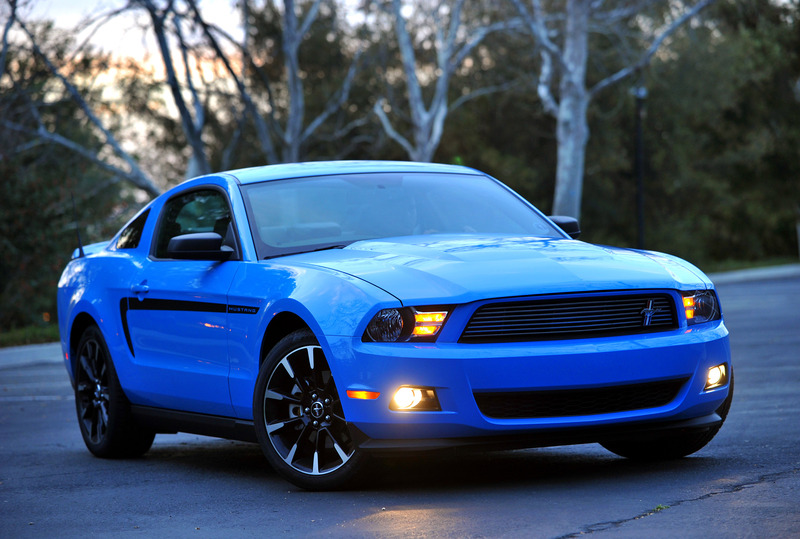 For 2011, Mustang's new 3.7-liter Duratec 24-valve V6 uses advanced engineering to deliver its power and economy: Twin Independent Variable Camshaft Timing (Ti-VCT) adjusts the valvetrain in microseconds. Aluminum construction means light weight. It's an engine designed to crank out torque down low, rev to 7,000 rpm and deliver the mechanical music sports coupe lovers crave everywhere in between. "This new V6 engine really speaks to what Mustang is all about," said Barb Samardzich, Ford vice president of Global Powertrain Engineering. "It produces power everywhere in the rev range and loves to be pushed hard. The Duratec 3.7-liter builds on our promise to use advanced technology to deliver both power and fuel economy." The high output is due largely to Ti-VCT, which allows variable control of valve operation across the rev range. The variable cams operate on a Direct Acting Mechanical Bucket (DAMB) valvetrain using polished buckets to reduce friction. The end result is as much as a 3 percent improvement in fuel economy and a 10 percent improvement in power output versus traditional engines without these advanced features. Ti-VCT is complemented by specially tuned composite upper and lower intake manifolds for efficient air delivery and lighter weight. Ignition power is delivered by a high-energy coil-on-plug design, while piston-cooling jets and a lightweight die-cast aluminum cylinder block improve the durability and efficiency of the 3.7-liter V6 design. Drivers can get the most out of the new V6 engine's output using either an all-new six-speed manual gearbox or a six-speed automatic transmission. Both come with the flexibility and fuel economy benefits of six forward ratios regardless of whether buyers want to shift for themselves or not. Drivers who prefer a manual gearbox will enjoy the short throws and direct feel of the shifter along with the relaxed cruising permitted by the extra top gear ratio. Customers choosing the automatic will be pleasantly surprised to find the advanced six-speed transmission does not sacrifice fuel economy - or performance - for convenience, delivering 31 mpg highway with crisp, quick shifts that maximize torque and horsepower. The automatic transmission also features a grade-assist or "hill mode" to improve drivability on hilly terrain. This technical innovation uses vehicle input - acceleration, pedal position, vehicle speed and brake status - to automatically determine the correct gear ratio while on an incline or decline. Hill mode eliminates sixth gear, extends lower gear operation on uphill climbs, and provides additional grade or engine braking for coast-downs. 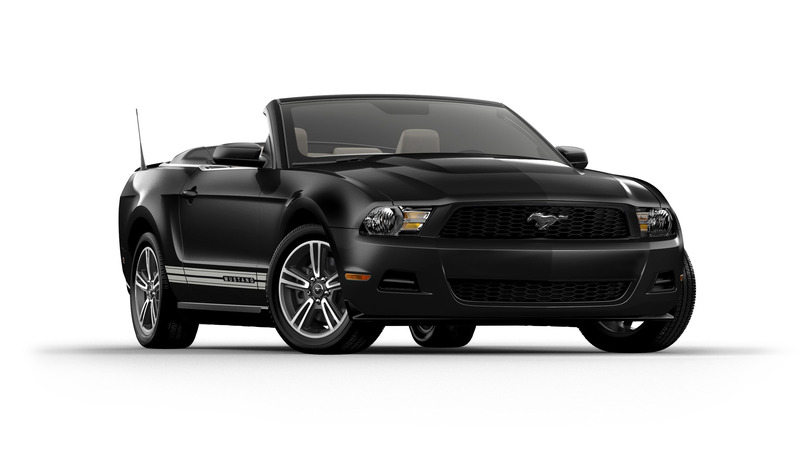 With so much additional horsepower standard, the 2011 Ford Mustang V6 received enhancements to its chassis to maintain the outstanding balance and driving behavior Mustang owners expect. Damper tuning and spring rates were revised to provide a smooth highway ride, while new rear lower control arms and stiffened stabilizer bar bushings improve stiffness and handling for better cornering response. EPAS also enables new technologies that adjust for minor driving annoyances. Drift-Pull Compensation adjusts the steering to correct for crosswinds and minor road crowning, while Active Nibble Control helps eliminate the "shimmy" felt at high speeds when a wheel is out of balance or a brake rotor is warped. Both conditions are alleviated by EPAS independent of driver input, helping ensure Mustang delivers a smooth, comfortable driving experience in all conditions. Ford Mustang buyers choosing the new V6 will also get a standard limited-slip differential that provides better handling and more sure-footed grip in poor weather conditions by directing engine torque to the rear wheel with the most traction. 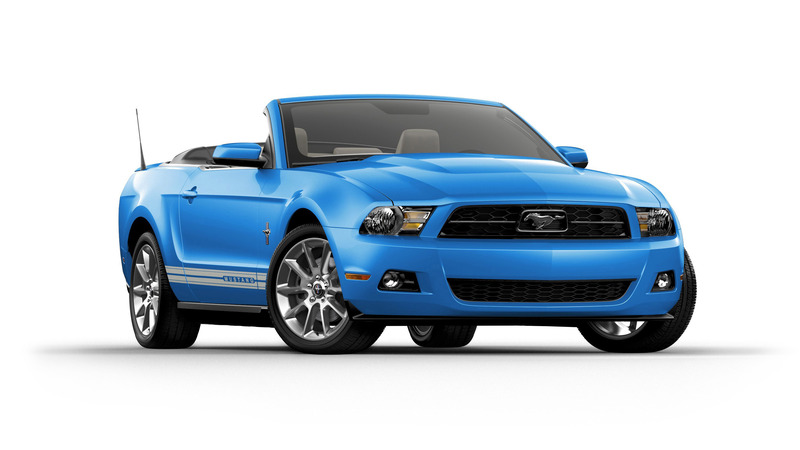 When the time comes to slow things down, the 2011 Mustang V6 is also equipped with larger four-wheel Anti-lock Braking System (ABS) disc brakes, with 12.4-inch front and 11.8-inch rear rotors. To reinforce the sporty nature of the 2011 Mustang, all V6 models will come standard with new instrument cluster graphics, including a speedometer that reads up to 160 mph and a tachometer that reads to 8,000 rpm, reflecting the free-revving style of the new engine. Additional lightweight soundproofing measures help filter unpleasant, high-frequency noises, while a tuned intake and dual exhaust add the sounds Mustang buyers relish. Enthusiasts who want a premium performance-oriented Ford Mustang V6 can opt for the new Performance Package, which will be available in August 2010. Ford's MyKey™ system, designed to encourage safer teen driving and seat belt use, also is newly available on Mustang. MyKey allows owners to program the vehicle key using the driver's message center to incorporate features such as limited top vehicle speed and audio volume, a traction control system that cannot be deactivated, a persistent Belt-Minder® seat belt reminder and various speed alert chimes. Mustang's technological advances are also incorporated in the structure of the vehicle, where improvements in body stiffness contribute to the coupe and convertible's driving performance and have a parallel benefit in accident protection. A stiff vehicle structure like that found on Mustang helps protect the cabin from deformation and intrusion in an impact. State-of-the-art technology adds to the convenience and safety of the 2011 Mustang, from the availability of the latest version of Ford SYNC®, with applications such as Traffic, Directions & Information, 911 Assist™ and Vehicle Health Report, to standard AdvanceTrac® Electronic Stability Control, which complements the all-speed traction control and standard ABS. 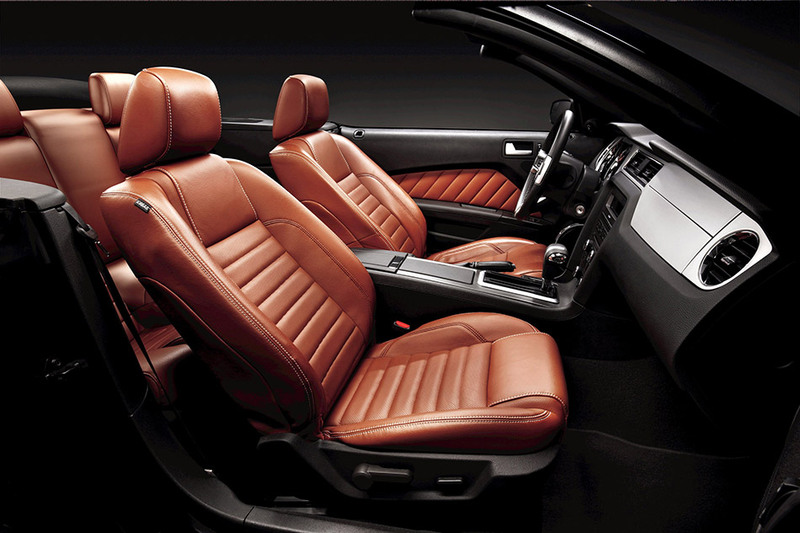 Additional standard safety equipment includes the Personal Safety System™, which features dual-stage driver and front passenger air bags, seat belt pretensioners and Belt-Minder. 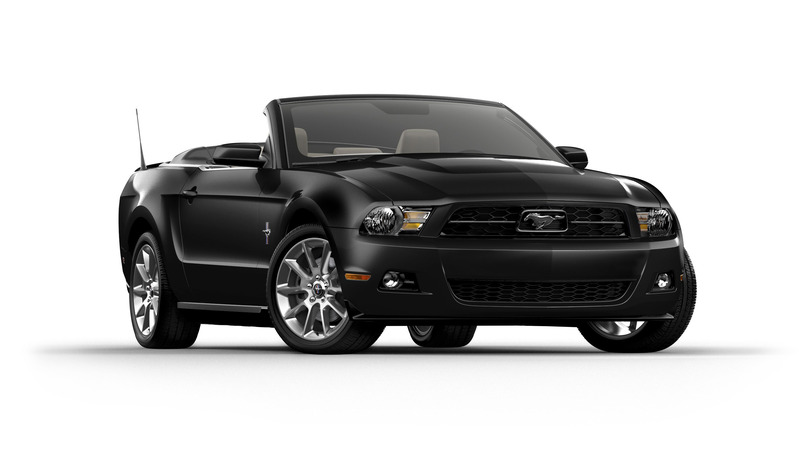 For 2011, Mustang exterior styling reflects the successful 2010 redesign, with new headlamps, lower fascias, fenders and grille capped by a powerdome hood that adds to the muscular appearance while functionally allowing for enhanced air cooling of the engine. Mustang's washer-fluid nozzles are tucked into the cowl, while the antenna resides at the rear, both changes creating a cleaner appearance while also reducing wind noise. Front fenders feature taut, sculptured wheel flares, like a tight skin stretched over the wheels. A classic spear character line on the doors leads to a modern indication of "hip" rear fenders. "The modern design provides Mustang with aggressive, forward direction, like it's ready to jump," said Darrell Behmer, Mustang chief designer. The rear end design features aggressively angled corners, a sculptured decklid and prominent badge. A rearview camera incorporated into the spoiler is available on some models. 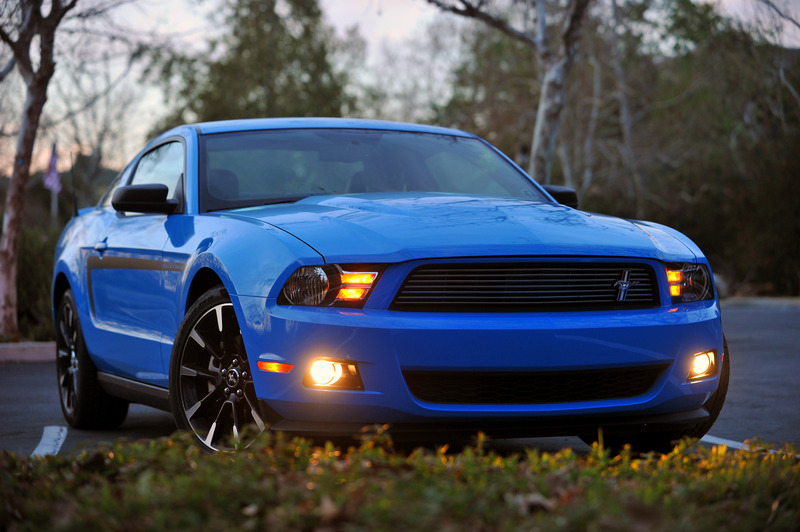 Mustang taillamps feature three LED bulbs firing sequentially from the inside for turn indication. The sequential bulbs were a distinct Mustang feature in the '60s, while the vertical reverse lamps evoke a modern version of the Ford classic three-lens taillamp. Inside, the new speedometer and tachometer are housed in a one-piece instrument panel. The design is crafted in seamless soft-touch TPO (Thermoplastic Olefin) skin fully encompassing available genuine aluminum-finish panels. Mustang's chrome-ringed gauges and dual-vane air register vents are precisely crafted and positioned, and the instrument panel and console flow as one shape - another strong connection to Mustang heritage. 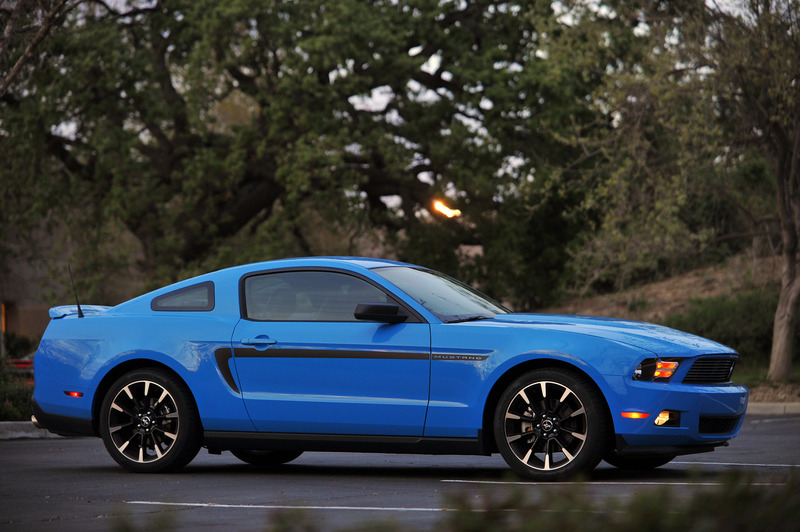 The 2011 Mustang will be built at the AutoAlliance International Plant in Flat Rock, Mich. The new 3.7-liter V6 will be built at Ford's recently retooled Cleveland Engine Plant No. 1. 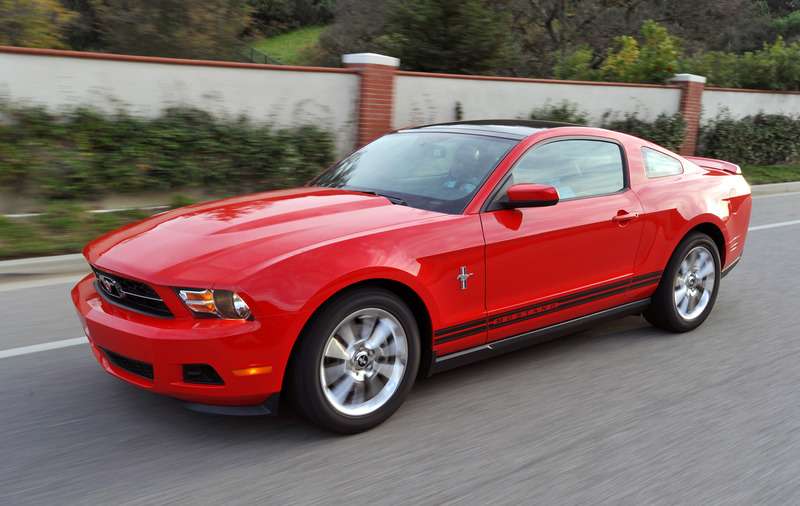 The heart of every Mustang is its engine, and beneath the hood of the new 2011 models beats a technological tour de force. On both the 3.7-liter V6 and 5.0-liter V8 engines, Twin Independent Variable Camshaft Timing (Ti-VCT) allows Mustang drivers to balance high performance and fuel economy. "Ti-VCT is a win-win-win technology," said Barb Samardzich, vice president, Global Powertrain Development. "It helps our new range of engines to deliver high performance with unsurpassed highway fuel economy and reduced emissions." Ti-VCT provides extremely precise variable - yet independent - control of timing for intake and exhaust valves. 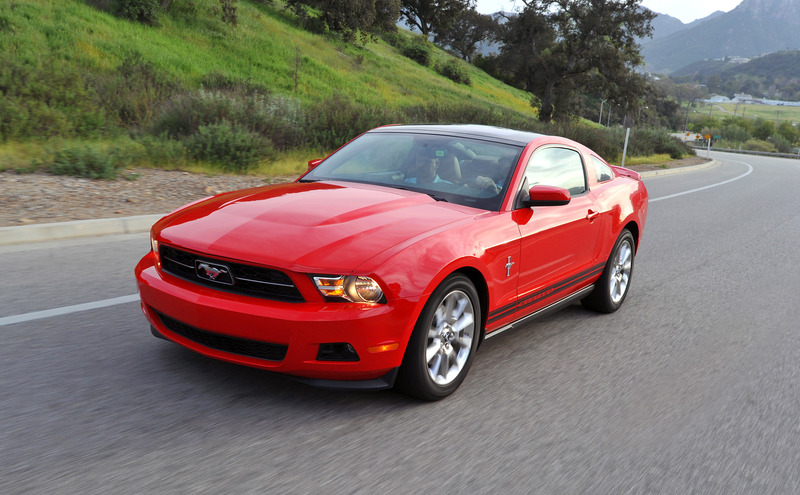 Drivers of the 2011 Mustang will notice abundant torque and class-leading fuel economy. An additional benefit of Ti-VCT is a reduction of emissions, especially in situations when the throttle is partially open. Independent adjustment of intake and exhaust valve timing allows maximum fuel economy at part-throttle, while delivering optimized power in full-throttle situations. An added benefit is improved drivability and responsiveness across the torque curve. 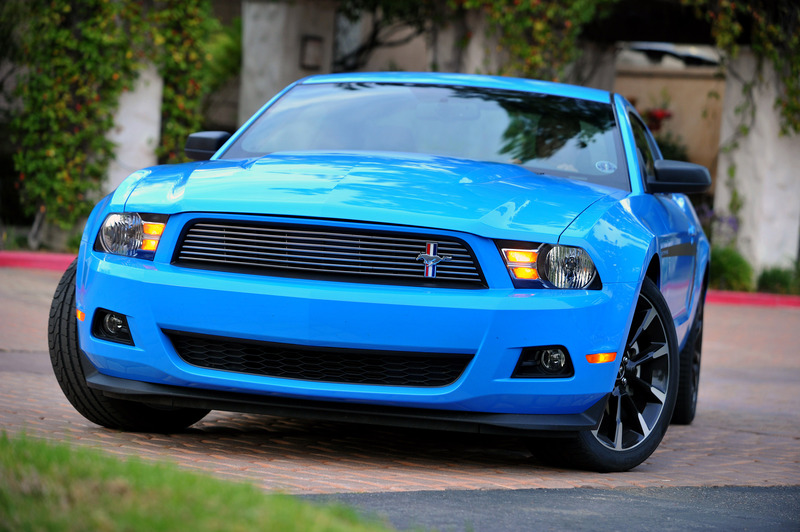 The new 3.7-liter V6 and 5.0-liter V8 engines offered in the 2011 Mustang use a double-overhead-camshaft (DOHC) configuration that employs two camshafts per cylinder bank - one camshaft to operate the intake valves and one camshaft to operate the exhaust valves. Traditionally, camshafts only have been able to open the valves at a fixed point defined during engine design and manufacturing. But with modern variable cam timing systems, the camshafts can be rotated slightly relative to their initial position, allowing the cam timing to be advanced or retarded. Ti-VCT takes this technology and applies it to both the intake and exhaust camshafts of the DOHC design. Mustang 3.7-liter V6 models use electronic solenoid valves to direct high-pressure oil to control vanes in each of the camshaft sprocket housings. By using one oil control solenoid valve per camshaft, controlled by the Electronic Control Module, each intake and exhaust cam can be advanced or retarded independently of the other as engine operating conditions change, providing an exceptional degree of valve timing control. 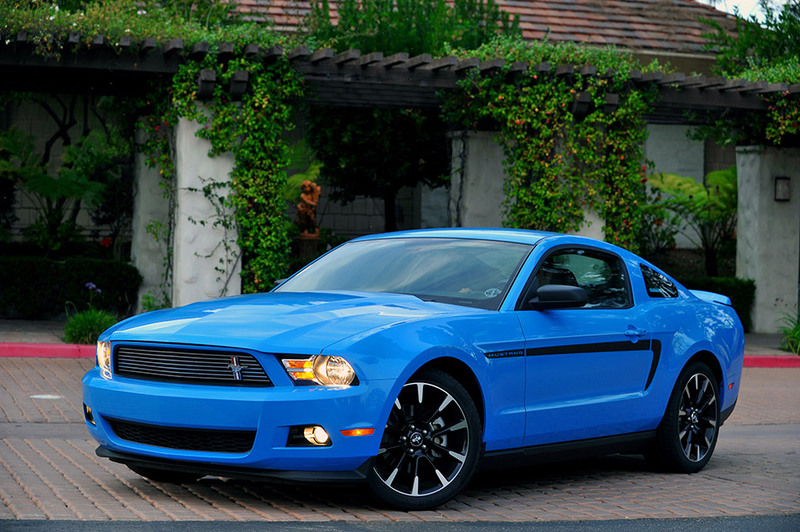 The Ford Mustang GT 5.0-liter V8 uses a Ti-VCT system actuated by camshaft torque, with assistance from pressurized oil. Using camshaft torque energy provides even faster throttle response and maximizes use of existing energy to aid fuel economy. Working like a ratchet, the one-way valves allow precise timing of camshaft events, continually optimizing timing to provide maximum torque or maximum fuel economy, based on driver input. "Ti-VCT technology will continue to proliferate across the Ford powertrain portfolio," said Samardzich. "By 2013, you can expect to see this advancement available on 90 percent of our nameplates." Around the globe, Ford's performance-tuned cars are known to provide an uncompromised driving experience in a remarkably civilized package. 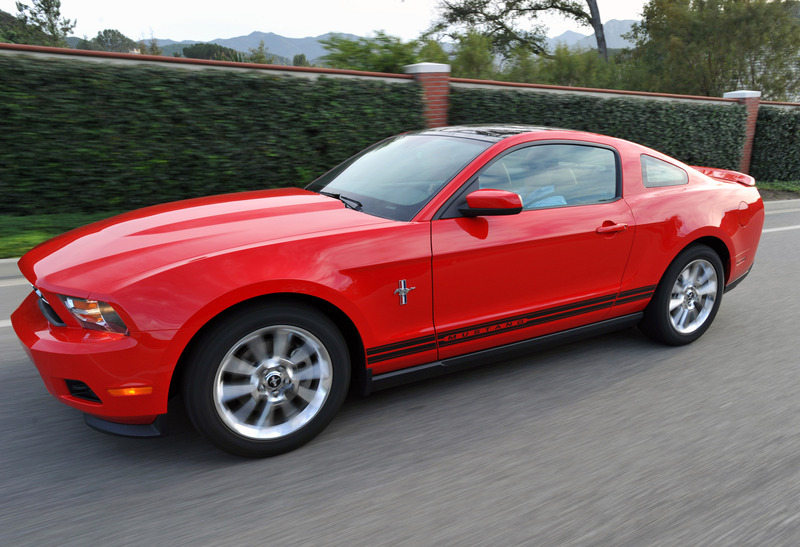 Growing from that tradition, the new 2011 Ford Mustang V6 will offer an optional factory-installed Performance Package that combines high-tech horsepower and a taut suspension in a package that will appeal to track-day fans and sports car aficionados alike. Powered by the same 305-horsepower all-aluminum Ti-VCT V6 as the new 2011 Mustang, the Performance Package takes advantage of the new engine's lightweight and high-revving nature to deliver a nimble performance car equally at home on a road course or a road trip. "The new Performance Package delivers on fast, fun and affordable, combining the all-new 2011 V6 with Mustang GT prowess," said Dave Pericak, Mustang chief nameplate engineer. "It's a true sports car for the new generation and a smart choice for the environmentally-conscious enthusiast. It is a perfect marriage of power, performance and value." 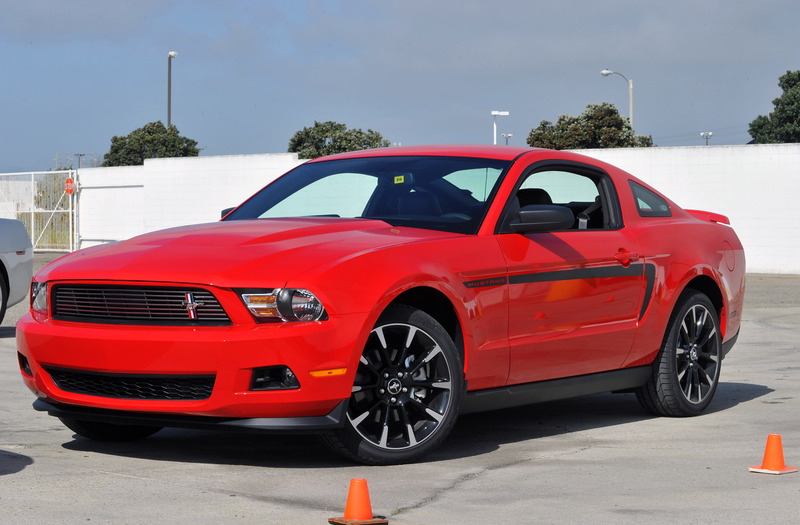 Borrowing from the Mustang GT, the Performance Package includes numerous suspension, braking and body stiffening upgrades to deliver unparalleled handling performance. That road-holding is helped by a near-equal front/rear weight distribution, providing exceptional transient response along with the car's slimmed-down curb weight of less than 3,500 pounds.